BLOOD WILL BE SPILLED. LIVES WILL BE LOST. FORTUNES WILL BE MADE. MEN WILL BE RUINED. 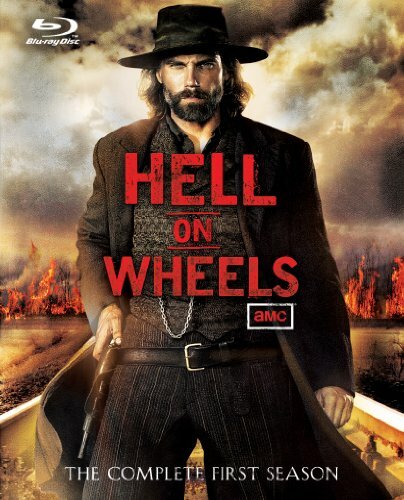 Credited for "helping to modernize the Western genre" when it premiered in 2011, Hell on Wheels centers on former Confederate soldier Cullen Bohannon (Anson Mount), whose quest for vengeance has led him to the Union Pacific Railroad's westward construction of the first transcontinental railroad. Currently reigning as the #2 rated show on AMC (with a series premiere that was the second highest rated AMC debut of all time), it is episodic TV at its very best. And before Season Two rolls into town this fall, home viewers can catch up on all the frontier drama in this star-studded smash with HELL ON WHEELS: THE COMPLETE FIRST SEASON, arriving on DVD and blu-ray this May, only from Entertainment One. "Hell on Wheels" tells the epic story of post-Civil War America, focusing on a soldier who sets out to exact revenge on the Union soldiers who have killed his wife. His journey takes him west to Hell on Wheels, a dangerous, raucous, lawless melting pot of a town that travels with and services the construction of the railroad, an engineering feat unprecedented for its time. The lavishly-produced series documents the railroad's engineering and construction, as well as institutionalized greed and corruption, the immigrant experience and the plight of newly emancipated African-Americans during Reconstruction. Chronicling this potent turning point in our nation's history, this fan favorite series shows just how uncivilized the business of civilization can be across 10 absorbing episodes. Developed by Endemol USA and produced by Entertainment One and Nomadic Pictures, Hell on Wheels is created, written, and executive-produced by Joe and Tony Gayton (Faster, Uncommon Valor, The Salton Sea, Bulletproof). * "Recreating the Past: The Making of Hell on Wheels"
* "Crashing a Train: From Concept to Camera"